I make all types of jewelry from wirework to basic stringing, metal stamping, handmade clay beads, crystal and mostly glass beads. I have been designing as a hobby for over 10 yrs now. 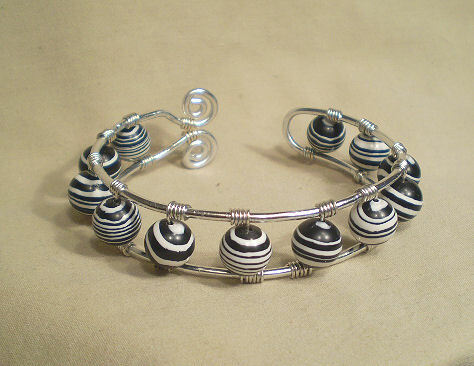 The bracelet up above is my popular spiral end cuff bracelet using black and white spiral beads, I have done a few of these and have entered one of these cuffs in a competition for beadaholique website and won in the top ten winners, a lifetime website with Artfire.com. The second picture (above) is a herringbone weave wire work making a necklace. The third picture (below) is my wirework earrings using Turquiose beads. I do a few vendor shows here and there when I can. Would love to make this my full time job some day.